Ive's designs for the iPod and the iPhone are network culture's icons, much as the Model T Ford or the Boeing 707 were icons of their time. Just as the earlier machines produced mobility, so do ours: mobile, networked technology allows most members of developed societies to compress space in a way reserved until recently for the media, government, and élite. In so doing opened it opens up a new phenomenological space. 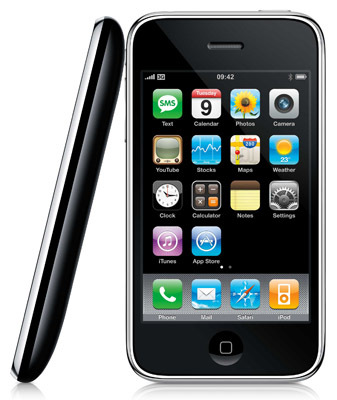 Mobile technologies allow us to disconnect from the world around us so that we may instead connect with individuals at a distance or, alternatively, with software agents residing either in our mobile devices or in the networked cloud (as data speeds rise, the difference between local and remote applications and data is becoming unclear). Although sometimes this disconnect with our surroundings is a matter of lament, more frequently it is a deliberate choice, a way to fill something we lack in space that surrounds us. If sometimes we use such technologies to augment immediate space-looking up the address of a destination on a map, calling a friend to triangulate a meeting place while in route-more often we employ them to distance ourselves-reading and writing e-mail, updating a social media site, immersing ourselves in a soundtrack of our own choosing with portable music players. Introduced in October 2001, the iPod was a runaway success worldwide. That it succeeded even though it was released just a month after the 9/11 attacks to a generally depressed consumer mood and a dismal economy points to its significance. By allowing individuals to paint the world with an emotional soundscape, it allows them to subject it to their control, making it familiar through the recognizable sounds it reproduces. Technology, it seems, could overcome alienation. Just as financialization is a mutation in the production of value from space, this disconnect is a mutation in social space. To understand the significance of both, however we need to compare them with earlier spatial experiences. Again, I'll begin with the hypothesis that intensification is an appropriate model of historical succession. Our own condition exacerbates the experiences of simultaneity and abstraction that first emerged under modernity. Nor should we be surprised about its relationship to the space of postmodernity: just as that period was marked by a fragmented, schizophrenic space, under network culture it is not so much the experience of space that has fragmented as space itself that has splintered, becoming discontinuous and multiform. -- EXCERPT FROM "SPACE. PERVASIVE SIMULTANEITY AND THE FINANCIALIZATION OF EVERYDAY LIFE" BY KAZYS VARNELIS, CHAPTER 2 FROM HIS BOOK-IN-PROGRESS "CULTURE IN THE AGE OF NETWORKS: A CRITICAL HISTORY OF NETWORK CULTURE"